European drug prevention quality standards: a manual for prevention professionals. Lisbon: European Monitoring Centre for Drugs and Drug Addiction, 2011. 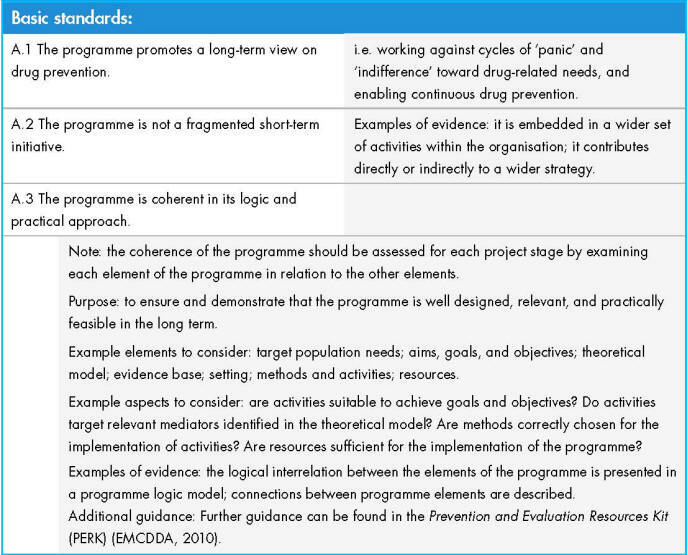 These first European standards on delivering high quality drug prevention may be assumed to be dry and technical, but could transform prevention practice if implemented, leading to fewer ineffective activities and an increased focus on approaches and interventions with realistic and achievable objectives. Summary A project led by Liverpool John Moores University's Centre for Public Health and part-funded by the European Commission has produced the first European standards on delivering high quality drug prevention. This account draws on the project page at the Centre for Public Health which describes the genesis, findings and methodology of the project, and on the final report on the project to the European Commission. The standards ( illustration shows first three as an example) outline the necessary steps in planning, implementing and evaluating drug prevention activities. Organised in an eight-stage project cycle, they cover: needs assessment; resource assessment; programme formulation; intervention design; management and mobilisation of resources; delivery and monitoring; final evaluations; and dissemination and improvement. Also covered are: sustainability and funding; communication and stakeholder involvement; staff development; and ethical issues. The project collaborated with partner organisations in Italy, Spain, Hungary, Romania and Poland. When the project was conceived European policy documents expressed an intention to develop and implement best practice in drug prevention, but without being able to provide a reference framework on how to do this. The standards project aimed to provide an empirically derived reference framework to bridge the gaps between science, policy and practice. Its specific objectives were to compile, review and analyse existing drug prevention standards in EU member states, and to publish a common set of European drug prevention quality standards. Availability of an agreed framework adaptable to local circumstances was expected to provide an incentive for states to develop quality standards where these did not previously exist, or to review and update existing standards, and adopt these quality standards for their own use. Adoption would it was expected improve drug prevention practice and cost-effectiveness, and reduce the likelihood of implementation of ineffective or counter-productive interventions. Drug prevention work in line with the standards is characterised by an evidence-based approach, internal coherence, and an orientation towards both policy and participants. The standards are applicable to a wide range of drug prevention activities (eg, drug education, structured programmes, outreach work, brief interventions), settings (eg, school, community, family, recreational settings, criminal justice), and target populations (eg, young people, families, ethnic groups). Drug prevention activities targeted by these standards may focus on legal substances such as alcohol or tobacco, and/or illegal substances. They can be used for a range of purposes, including: information, education and guidance; self-reflection; group discussions; and performance appraisals. From a theoretical point of view the project distinguished between quality standards and practice guidelines. Quality standards focus on formal aspects of general quality assurance, while guidelines give instructions on the content of interventions for specific circumstances. Adherence to minimal technical standards improves design and outcomes of prevention interventions. The focus on quality standards allows knowledge and evidence to be transferred between countries, and establishes a common ground in public health, a sector where guidelines are rarely as specific as clinical guidance. The standards make no recommendations about prevention models or manualised interventions. This is largely because of the rather weak evidence base, the need to reflect diversity in practice, and because evaluated interventions have rarely been implemented at a level beyond the effectiveness trial. Instead the project focused on standards that help commissioners or developers understand concepts of effectiveness, important requirements of programme adaptation, or key features of intervention/project development. Though commissioned to produce standards on 'drug prevention', the project recognises that drug prevention activities should not be delivered in isolation and such activities should target a range of risk and resilience factors. The project methodology proceeded across three stages. Firstly, national and international drug prevention standards and guidelines were collated, and documents suitable for review were identified. The quality standards were synthesised in a systematic and iterative manner through qualitative content analysis, and a first draft was generated. Then the draft standards' relevance was rated through an online two-stage survey of 423 drug prevention professionals, and expert focus groups were conducted in five European countries with 122 drug professionals and policymakers. These highlighted the most important items in the draft standards and how the framework might fit the wider European context. Consequently, a second draft of the standards was produced. The final stage explored the applicability of the standards in everyday practice through structured consultations with 72 participants, and information was collected on how the standards might be further developed. This feedback enabled the partnership to produce a final version of the standards, consisting of basic and expert standards and detailed guidance on how to use them. More on how the standards were developed can be found in the final report. • The programme reflects a comprehensive approach towards health and social functioning and is designed as a continuous long-term process. • The programme is not a fragmented short-term initiative. There is a clear written statement of factors to assure sustainability after initial completion. • The target population is considered as a stakeholder in the programme and involved at all stages as a partner in its development. • The programme values participants' experiences and acknowledges their (difficult) realities. • The programme has clear benefits for participants; it is not a self-referential and self-promoting activity or policy in benefit of the organisation providing or commissioning it. • Programmes must be informed by an empirical assessment of people's needs including their culture and perspectives on drug use, and risk and protective factors for drug use should explicitly be mapped. • When planning drug prevention work, it is important to be aware of and make use of existing knowledge through a systematic analysis of relevant professional literature and by ensuring correspondence with the evidence revealed by this review. • The programme is derived from an evidence-based theoretical model which allows an understanding of specific drug-related needs and their causes in line with the needs assessment, and an understanding of how targeted behaviour can be changed. The model is described and justified. • Aims, goals, and objectives, are defined, including the main benefits for participants. Without this there is a serious risk of conducting drug prevention work for its own sake, instead of for the benefit of the target population. • Monitoring is seen as an integral part of the implementation phase. Outcome and process data are frequently collected and systematically reviewed. A much shorter version of the standards was developed to inform the prevention component of the European Commission's minimum quality standards in drug demand reduction developed in draft by the EQUS project, which also include standards on treatment and harm reduction. The team which produced the standards have been awarded further European Commission funding to develop tool kits and training to allow key user groups to put the standards into practice. They acknowledge that one gap in the standards is that they refer to, but do not address, professional competencies, yet if the aim is to modify drug-related cognitions and social behaviours, this work should only be undertaken by a competent workforce in order to reduce the risks of counterproductive intervention. A different European Commission project will address this issue. Thanks for their comments on this entry in draft to Harry Sumnall of the Centre for Public Health at Liverpool John Moores University in England, and to Eric Carlin of Scottish Health Action on Alcohol Problems based in Edinburgh in Scotland. Commentators bear no responsibility for the text including the interpretations and any remaining errors.